Yesterday son Joe and Tom came to do the tree work on our stand of Sycamores. 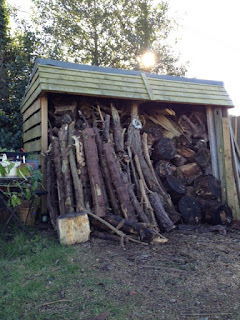 The plan is to crown lift and thin every year or so, trim the fallen branches and then log the bigger ready to go in the Log Store to be dried and seasoned for the following year. Great excitement and activity on a bright winters day. Because of this mild winter the native narcissus out on the grass verge are beginning to emerge and juvenile bluebell leaves also. So my plea was for the heavy work to proceed but without trampling these emerging treasures. A sensitive soul, Tom managed to do this for the most part by jettisoning the branches over the balding hedge into the meadow the other side. Much to my delight. Leaving the two strong men to carry out the felling task I jumped on my bike to cycle to the local store for fresh bread and provisions, knowing that a Woodlander works better on a full stomach of warming soup. Turning the road to the Bay I was met by a surprising sight. A flock of scruffy sheep being shepherded along the road bringing the bemused traffic to a standstill. It was a scene more reminscent of a lane in New Zealand than the main road to the Bay. It transpires that a full trailer load of sheep had overturned at the main junction. On my return the fall out from this upturning was clear for all to see with the distressing sight of an injured sheep collapsed close to the rear of the trailer and the local Bobby re-routing traffic. Sharing this excitement(you can tell we live in a quiet rural community)over the soup and crusty bread the subject somehow then moved on to Tom's forthcoming second trip to New Zealand. We all reminsced over our collective experiences and expressed our love of the place. I then presented him with my NZ Tree Guide,which seemed fitting for such a tree hugger. He is going to take a Permaculture Design Course whilst there at the Tui community in Takaka, South Island. One of the first and most original of the communities set up in NZ. Equal in influence to our own Findhorn in Scotland. So I am delighted that the books will have a good leafing through. After lunch as the felling work ceased so began the joy of lighting a woodland fire to burn off the thinner twigs and waste. What is it about the raw joy of fire lighting that ignites so many enthusiasms? We re-jigged some of the accumulated debris around the Log Store and positioned two large shrubs to be planted as part of the screening and then began the very serious debate of how to stack the logs and create the log pile.This is a subject that ignites passions and enthusiasms. Stood amongst three men all equally passionate about how to set out about this task I found myself reflecting on the many issues arising. Life-threatening historically to get right and a matter of great pride amongst a rural community to provide fuel and warmth for the winters warmth and cooking, the Log Store was a vital survival tool. In the same way that women have re-claimed the Shed so I find that I too have a view on how our Log Store should look and the way that it should blend in with the rest of my large garden. Tom has the greatest practical knowledge and shared his considerable experience about the differing types of wood , how to season them and how they burn. 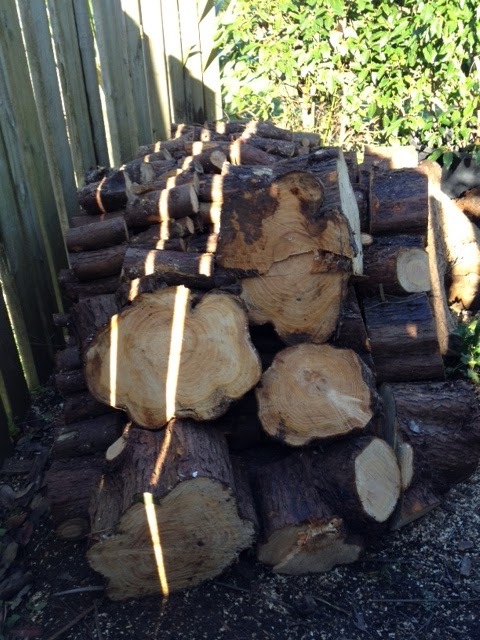 Tomorrow we are receiving some large pieces of pine destined for the log store and they will need at least a year to dry out as they are very resinous. In a log burner they present few problems if mixed with other woods, like our Poplar or later the Sycamore. But in an open fire they can spit a lot as they are so full of sap. Fascinating stuff! I adore log piles, built creatively as a form of land art. Over the years I have built several creations including a log dragon, a sinuous caterpillar and log stepping stones. I like the fact, that as they biodegrade they form a wildlife habitat so are important to have in any garden. 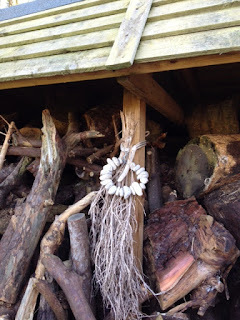 My current favourite is to see logs stacked under a bench or tight against a house . The patterns are pleasingly geometric as they stack one row upon another, lending a safe, homely feel to the winter garden. This winter a new best- selling book has taken the book buying public by storm entitled, 'Norweigan Wood. Chopping, stacking and drying wood the Scandinavian way' by Lars Mytting.